What are the best RV water heaters? While going camping with your RV, you need at least some degree of comfort if you want to feel cozy and warm. Because you can’t have your morning shower with cold water, you must get the best RV water heater on the market. After reading various reviews from other customers and experts, we’ve concluded that a great choice of RV water heater is the Suburban 5117A. This unit doesn’t require special maintenance because it is powered by propane. Easy to use and to install, the water heater benefits from a large diameter drainage port and a convenient door for easy access. Plus, it works great with all types of RV. If you can’t the Suburban 5117A, make sure to check the Aquaking AKOUTDOORSMAN, another great option. The product works on propane and gas fuels and represents a quick and reliable solution for those looking for a quick shower in the morning when camping. It has a total capacity of 6 gallons of water and can fit most RV models, older and newer. It comes with pilot ignition for safety purposes and can provide heated water in a matter of seconds after turning it on. The product is easy to install. Minor modifications to the gas pipelines or the use of additional installing tools may be required to make this product work. This item is great for when you’re camping with your family and need running water to wash the dishes or take a quick shower. The two main characteristics of this water heater are the lightweight design and its portability. It only weighs 10 pounds, so you can easily move it from one place to another and install it. It works on propane and, as long as you have running water, it will heat it up and help you enjoy a refreshing hot shower in the morning. It is ready to run in around 15 minutes and features easy-to-use dials. The product works on two D-cell batteries that aren’t included in the package, so you must purchase them yourself to make the item running. By far one of the lightest heaters on the market, the product is perfect for trailers and RVs. This product is perfect for camping and light outdoor use. It is compact and portable since it doesn’t contain an additional tank. It works great with the brand’s 1.2GPM water pump. The heater can reach a maximum temperature of 114.8 degrees Fahrenheit, enough for washing your hands and face in the morning. The energy-saving technology makes it reliable and cost-effective in time. Some customers mentioned the water doesn’t get hot enough and gets cold easily, making it less useful in the colder fall or spring days. If you plan on taking a quick outdoor shower, bathe your dog or your horses, this product is a good solution. We all know how important it is to be able to enjoy hot water even when we’re on the go. Because not all RV’s come with water heaters, it’s quite logically why you need to study the offer available for sale. We’ve made this short presentation for you that can help you decide faster about which item fits your needs best. In your search for the best tankless water heater for RV, you need to learn that there are three types of heaters, depending on the fuel source. The majority of RV water heaters are designed to operate on electricity and liquid propane together. Because of this versatility, you get to use the unit on more than one power source and even simultaneously. This way, you can rest assured that the water in your RV gets hot in an instant. 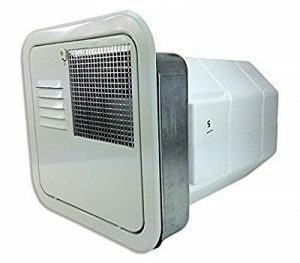 There is another type of heaters that utilize a more sophisticated source of power. These are called motoraid because they require the cooling system of the RV in order to heat the water. When the RV’s engine is running, the water located in the system circulates through the submerged tubes in the water heater. As the water starts to circulate through these tubes, the water begins to warm. Water heaters that use liquid propane or LP can be purchased in two models that only differ in terms of the ignition system. The most sophisticated type of the ignition is the Direct Spark Ignition, while the Manual Pilot Light is the basic option for most RV’s. The basic model utilizes a pilot light that you need to turn it manually. When the pilot light is off, you can switch the Pilot Control if you want to allow the gas to flow. This safety option that enables you to turn off the pilot light is beneficial for preventing the LP gas from leaking. One thing you need to be aware of is that the pilot light mustn’t be lit when the RV is in motion. Because the wind is able to blow the pilot light, it’s quite clear why you should keep it off. However, it takes less than 20 minutes to prepare your hot shower. According to most RV water heater reviews, those units that are outfitted with Direct Spark Ignition are preferable because they don;t need a pilot light. Instead, the gas thermostat sends a signal to the heater which opens the gas valve. Once the igniter is turned on, if there are no issues, the flame starts to develop. The best part is that when the sensor doesn’t detect the flame, after 15 seconds the valve closes, and the entire system shuts down. From there, an indicator light will signal that the water heater has failed to light and the unit will be turned off and reset before making a new attempt. Even though you can drive your RV while heating the water, it’s better to wait until you’ve reached your destination. When in the market for the best RV tankless water heater, you need to pay attention to the size of the unit as well as the capacity. Ideally, you should invest in water heaters that are small and lightweight because they are usually installed outside, below the floor or in the area located behind the baggage room. Therefore, you need to be careful not to reduce the amount of room inside your RV. As far as the capacity goes, it all comes down to the amount of water you need during your camping trip. Choose a model that satisfies your needs. 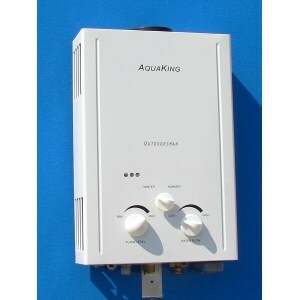 This water heater is a great choice of RV heater because it has a 6-gallon capacity and uses LP gas as a power source. Moreover, it depends on the manual pilot as an ignition system, which comes in handy if you want to ensure safety while being on the road. 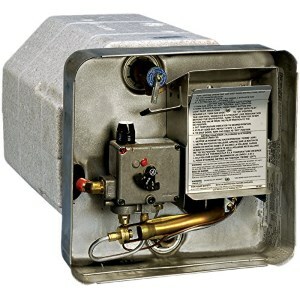 Having an RV water heater that depends on the manual pilot ignition means that you are allowed to have full control over the gas and heating system. This way, you can choose when to heat your water for shower or cooking activities and prevent potential gas leakages. This heater works best for campers and trailers, and it doesn’t require much maintenance. Because it uses propane, you can rest assured that even if you leave the water heater idle for a period of time, it won’t start working without your manual permission. Furthermore, the capacity of 6 gallons is more than enough for camping with your family. This ultra-portable water heater is incredibly small and lightweight which means it won’t occupy too much room. With a weight of only 10 lbs you can easily move the unit anywhere, you like it, without putting too much effort. If you have a supply of running water and propane, you don’t need anything less to start enjoying your hot and steamy shower. Easy to set up, the process doesn’t take more than 15 minutes. 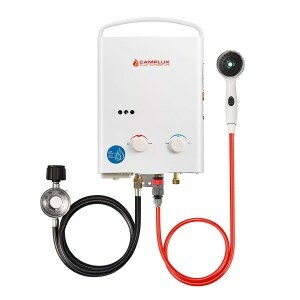 Plus, the tool comes in handy for your RV because it can rapidly hook up to your existing water connections located in your water heater cabinet. The product is outfitted with easy-to-use dials placed on the front that allow you to select between two options, winter or summer. Since the device is a tankless heater powered by propane gas, there’s no need to stand-by or recovery time. Keep in mind that the heater requires 2 “D” cell batteries that aren’t included in the package. If you need a reliable water heater that requires only 2.5 PSI of water pressure in order to deliver hot water for your RV. Besides, the maximum temperature reached by this unit is 114.8 F degrees while the minimum is 46.4 F degrees. Therefore, you can use the water for taking a shower or for cooking activities. Thanks to its compact size, the water heater can be placed anywhere you like without having to worry about occupying too much space. Moreover, it is outfitted with a folding handle that keeps the unit out of your way and comes in handy for outdoors setups. Also, there’s no need to worry about safety issues because the product comes with a 20 minutes automatic safety option and a flame failure feature. The best part is that it boasts anti-freezing and oxygen depletion safety shut-off protections. Thanks to the ideal gallon capacity you get instant water that lasts for long no matter where you decide to camp.